Mission: NG-11 – Antares II, Wallops Flight Facility, Va.
Only two sats remain, HARP and TJREVERB moved to NG-12. The question is about the three Virginia CubeSat Constellation satellites, which are readdy to fly, but not included in the new schedule. They have changed it again. 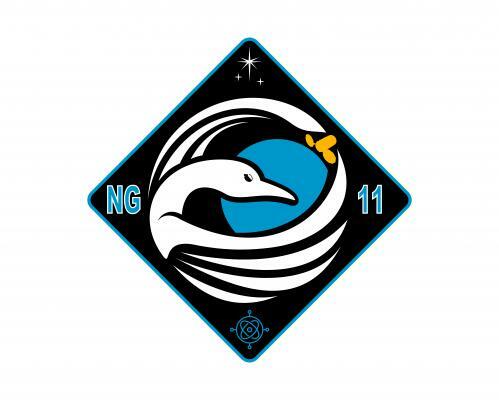 Now only the VCC sats are on NG-11. As I assumed CAPSat is now NG-12, HARP is missing. HARP is now on NG-12. Thank you. The list was changed again. Yesterday 16 sats were on NG-12, now there are 18 sats. Despite its little size, KRAKsat has a huge task to complete. It will travel on the board of Cygnus ship and Antares rocket until, in April 2019, achieves International Space Station. Satellite will be launched from ISS into space at height of 400km. 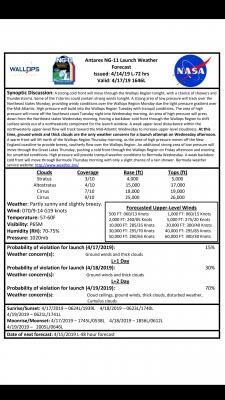 Northrop Grumman is targeting Wednesday, April 17, for the launch of its Cygnus spacecraft on an Antares rocket from pad 0A at NASA’s Wallops Flight Facility in Wallops Island, Virginia. Pete Hasbrook, associate program scientist for the International Space Station Program at NASA’s Johnson Space Center in Houston, and Patrick O’Neill, senior manager of marketing and communications for the station’s National Lab, will provide an overview of the research and technology aboard Northrop Grumman’s Cygnus spacecraft. Richard L. Hughson, Schlegel Research Chair in Vascular Aging and Brain Health and senior director of research at the University of Waterloo Research Institute for Aging, will discuss the Vascular Aging investigation, which analyzes ultrasounds of the arteries and wearable sensors of the space station crew members. Roberto Piazza, professor of condensed matter physics, Polytechnic University of Milan, will discuss the Advanced Colloids Experiment-Temperature-10 (ACE-T-10) investigation, which tests gels in a microgravity environment. Knowledge gained from this investigation can be applied in efforts to grow increasingly complex materials used to build new materials and equipment in space. Trevor Castor, President and CEO of Aphios Corporation, will discuss Targeted Nanoparticles for Orphan and Chronic Diseasesin a Microgravity Environment Using Green SuperFluids Technology (STaARS BioScience-11) investigation. Nanosomes or nanoparticle delivery systems are being studied for use in targeting chronic diseases, such as Alzheimer’s and HIV. Nanoparticles created in microgravity are much smaller, enhancing drug uptake and delivery. This approach potentially reduces the required dose per treatment and decreases cost per dose. Laura Shaw, International Space Station Program Lead for Exploration Life Support Systems, and John Garr, Exploration Life Support System Integrator, will discuss the Thermal Amine Scrubber, a technology that tests a method to remove carbon dioxide from air aboard the orbiting outpost. NASA will use the station as the testbed to evolve the station’s life support system into an evolved system for use on Gateway to support missions to the Moon and eventually for Mars missions. Brian Banker,Seeker deputy project manager, will discuss Seeker, a flying robot prototype to be used outside spacecraft to perform inspections. This investigation will take place after the Cygnus resupply spacecraft leaves the space station and will fly the robot on basic maneuvers to take high-resolution images of Cygnus. To participate in the teleconference, media must contact Gina Anderson at 202-358-1100 or [email protected] by 10 a.m. Tuesday, for dial-in information. The Cygnus spacecraft will carry crew supplies, scientific research and hardware to the orbiting laboratory to support the Expedition 59 and 60 crews for the 11th contracted mission by Northrop Grumman under NASA’s Commercial Resupply Services contract. Seeker will be deployed from the NanoRacks External Deployer. A Northrop Grumman Cygnus spacecraft scheduled to lift off no earlier than April 17 will carry supplies and scientific experiments to the International Space Station. For this mission, Northrop Grumman will use a new late load capability that allows time-sensitive experiments to be loaded just 24 hours before liftoff. 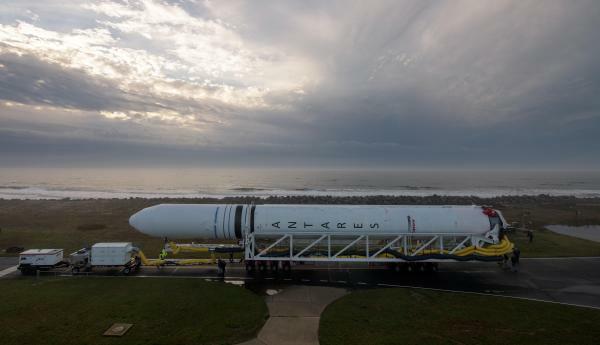 NASA’s commercial partner Northrop Grumman is scheduled to launch its Antares rocket carrying its Cygnus cargo spacecraft to the international Space Station at 4:46 p.m. EDT Wednesday, April 17. The launch, as well as briefings preceding and following liftoff, will air live on NASA Television and the agency’s website. Loaded with 7,500 pounds of research, crew supplies and hardware, this Northrop Grumman’s 11th commercial resupply NASA-contracted mission. It will launch from Virginia Space’s Mid-Atlantic Regional Spaceport at NASA’s Wallops Flight Facility. About two-and-a-half hours after launch, an automated command will initiate deployment of the spacecraft’s solar arrays. Full deployment will take approximately 30 minutes. The Cygnus spacecraft, dubbed the SS Roger Chaffee, will arrive at the space station Friday, April 19. At about 5:30 a.m., Expedition 59 NASA astronaut Anne McClain will grapple the spacecraft using the station’s robotic arm. She will be backed up by David Saint-Jacques of the Canadian Space Agency. NASA astronaut Nick Hague will monitor Cygnus systems during its approach. After capture, ground controllers will command the station’s arm to rotate and install Cygnus on the bottom of the station’s Unity module. Media registration for the launch and associated activities is closed. However, media may participate via phone in the What’s on Board briefing and prelaunch and postlaunch news conferences. Media interested in participating must contact Gina Anderson at [email protected] for call details. The Cygnus spacecraft is scheduled to remain at the space station until July 23, when it will depart, deploy NanoRacks customer CubeSats, and then have an extended mission in orbit until December before it will dispose of several tons of trash during a scheduled fiery reentry and destruction in Earth’s atmosphere. 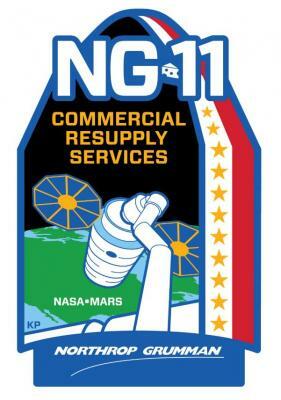 This will be the final mission under Northrop Grumman’s Commercial Resupply Services (CRS-1) contract with NASA before starting the CRS-2 contract missions this fall. Under Northrop Grumman’s contract, the company will fly 11 missions. I'll be at the launch, watching from the NASA viewing area! Always excited to see these. Is the NSF twitch team going to be at the launch? Loaded with 7,500 pounds of research, crew supplies and hardware, this is Northrop Grumman’s 11th commercial resupply NASA-contracted mission. It will launch from Virginia Space’s Mid-Atlantic Regional Spaceport at NASA’s Wallops Flight Facility. 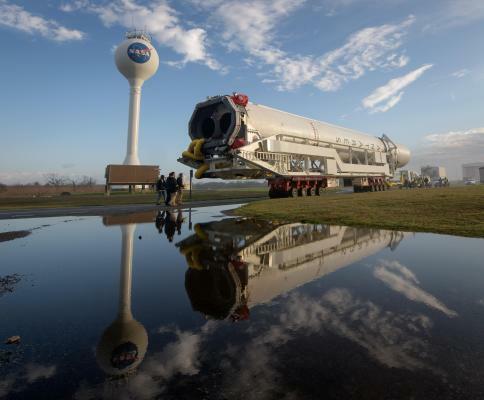 The team rolled the Antares rocket out from the Horizontal Integration Facility at Wallops the morning of April 15. Serial numbers visible at highest resolution. First stage appears to be Taurus 2 Stage 1 No. 10. The duo, supported by NASA astronaut Nick Hague, continued reviewing procedures and practicing robotics maneuvers today as Cygnus counts down to its Wednesday launch. NASA TV will broadcast the launch and capture activities live. More virtual reality filming continued today and has been ongoing for several months now inside the orbital complex. The crew has been filming a 360° experience depicting life on the station for future viewing by audiences on Earth.